Sri Lankan tea producer Dilmah is taking a leaf from the wine industry by marketing its beverage as high-end and chic. (Fortune Magazine) -- Dilhan Fernando gathers a fistful of earth and surveys his family's sprawling estate. "What's grown on that field," he says, pointing to lush cultivation on a distant misty hill, "will differ dramatically from what's grown over here." He lets the dirt sift through his fingers, as if for emphasis. "And they will both be superb drinking." No, this is not France or Northern California, and the drink isn't a cherished chardonnay. We're in the verdant highlands of war-torn Sri Lanka, where the terrain is sculpted with waist-high tea bushes, and where a marketing makeover for the humble cup of tea is underway. 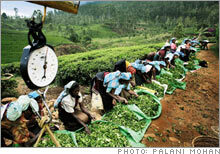 Fields of green: Sri Lankan tea pickers wait to weigh their haul. Heirs to one of Sri Lanka's biggest businesses, a $500 million enterprise with sales in 93 countries, Dilhan, 40, and his brother Malik, 41, are trying to make tea fashionable and claw back some of the $70 billion global hot-beverage market conceded to coffee. The world may drink more than a billion cups of tea a day, but big producers have struggled to add value to the brew, while Starbucks (Charts, Fortune 500) and other coffee brands have prospered. So the Dilmah Group - the name is taken from the first syllables of the brothers' names - has positioned itself like fine wine. Its elegant packaging is heavy with wine iconography: descriptive labels equating a robust black tea to a shiraz, or a fine white leaf to champagne. The aim is to present the tea as the purest in the world while also playing to consumers' health concerns and rising enviro-consciousness. Unlike the blends in an average tea bag, which can contain leaves from several countries, Dilmah teas, it says, are from a single origin. "You have to regard tea in the same way as you would an immaculate vintage," says the brothers' 77-year-old father, group patriarch Merrill Fernando. "People need to know what they are drinking." That's an attractive pitch, but it doesn't wash with Dilmah's main competitors, beverage majors like Unilever (Charts), whose Lipton brand is world leader with 15 percent of the global market, and Associated British Foods, second with Twinings at 6 percent. "The wine analogy is fairly ridiculous in big wine-drinking countries, which also tend to be tea drinkers," says John Cornish, Twinings' international marketing director. The big multinationals would say that, snorts the elder Fernando, who says he has spurned many offers to buy him out over the years. "I've stayed true to the leaf because I believe in its quality, and not in its mass-market commoditization." The company - "my third son," as Merrill describes it - which was founded in the midst of civil war in 1988, effectively created a new market segment that the industry now calls "curiosity teas." But Dilmah is less and less a niche player today. According to Euromonitor, a London market research consultancy, Dilmah is now the world's third-largest standalone global tea brand, about even with Tetley, which is owned by India's Tata Group. Merrill claims Dilmah's innovations have forced competitors to follow with their own specialty brands. Starbucks, too, has caught the boutique-tea trend, with its 1999 purchase of Tazo Tea. "Dilmah is a very interesting company," says William Gorman, executive chairman of Britain's Tea Council. "This is an industry that has been incredibly slow to innovate, and relatively tiny Dilmah has showed it how." The company has doubled in size since 2000, averaging annual 15 percent growth in revenue and profit, according to Dilhan, who adds that an edge in quality allows margins up to 40 percent higher than those of its competitors. Dilmah's latest gambit is T-Bars - standalone, chic-and-trendy outlets targeting the Buddha Bar set. A recent Miss World is the brand ambassador. Some 65 T-Bars have opened in rising economies like Poland, Belarus, Kazakhstan and the United Arab Emirates, places where the industry majors have a lesser presence. The first in the U.S. is to open in San Diego in September, and the company hopes to have 200 T-Bars by 2015. Dilmah is also planning releases into the sector's fastest-rising segment, ready-to-drink teas, where Twinings and Lipton have made early inroads. "The strong desire among consumers for a refreshing, thirst-quenching natural beverage has spurred growth of ready-to-drink teas," he says. "But the reality does not yet deliver on the expectation of health and natural goodness." Talk of natural goodness may seem out of place in Sri Lanka, which isn't exactly the world's healthiest economy. Dilmah operates within a creaking infrastructure and labor laws scarcely improved since British rule ended in 1948. That can make getting goods from plantation to port tricky for a product that stresses freshness, says Dilhan, citing a 100-mile journey from Dilmah's estates that can take as long as seven hours. And that's only if Colombo's port isn't locked down and military security checks are smooth. This tiny Indian Ocean nation of 22 million has been crippled by a bitter civil war between its minority Tamil (and mainly Hindu) community, pressing for a separate state in the northeast of the island, and the majority Sinhalese (and mainly Buddhist) community in the south. The conflict has killed 70,000 people since 1983. A cease-fire in 2002 briefly brought peace - and a short-lived economic boom - but fighting broke out again last year. Worried shippers have abandoned Sri Lanka out of fear that their vessels will be attacked - resulting in freight costs up to 50 percent higher on the fewer ships braving Sri Lankan ports. "We've been able to manage and grow the business around the conflict," says Dilhan. "But we watch things very closely." Dilmah's tea estates lie in the middle of the island, and their functioning depends on a delicate political balance. The Fernandos are Sinhalese, but most of the group's 37,000 workers are Tamil, primarily women descended from indentured laborers brought from India in the 1800s to work on then-Scottish-owned estates. While the remote tea region is mostly peaceful, estate managers note with some concern that effigies of homegrown Tamil Tiger leader Vellupillai Prabakaran have begun to appear in the area's Hindu temples. The country's complexities are reflected in Dilmah's marketing. Although the island has been called Sri Lanka since 1972, Dilmah and the state tea board market themselves as producing Ceylon tea; the island used to be known as Ceylon. That's not because the Fernandos are nostalgic for colonial rule. It's simply good business. "Sadly," says Malik, "too many people associate the term 'Sri Lanka' with strife." Dilmah is unusual in the tea industry in being a vertically integrated operation - producer, packager and marketer of its own teas. But that has often been a thorny thing to be in Sri Lanka. Next to remittances from overseas laborers, the tea industry is one of the biggest foreign-exchange earners in one of the world's poorest countries. It has endured nationalizations, followed by halfhearted privatizations. Various post-colonial administrations in Colombo, the capital, tried loosening the grip of the British tea estate houses, eventually succeeding in the 1970s by simply seizing them. But the move backfired. With bureaucrats in control, Sri Lanka's tea industry almost collapsed as planters moved to Kenya. Barely a player in the 1970s, Kenya now vies with Sri Lanka as the world's third-largest tea producer and biggest exporter, after India and China (which consume most of their domestic output). "We definitely would have been more successful than we are today had we not had these problems and policies," says Lalith Hettiarachchi, chairman of the Sri Lanka Tea Board. Merrill Fernando got his start in 1950, when he was 20. It was a tough time, when estates were under colonial control and elephants would transport heavy machinery from Colombo. Close links to government helped. (His ex-wife - the brothers' mother, Devika - was a daughter of a government plantation minister.) So did the lucrative business of selling bulk tea to the former Soviet Union and Saddam Hussein's Iraq in the 1980s, which gave him the financial wherewithal to start Dilmah. Now hailed as an industry legend, he likes to keep old traditions alive, while his sons project a modern image for tea-drinking. The next challenge confronting Dilmah may have nothing to do with politics or marketing. Merrill recently fell ill and is progressively handing over control of his well-oiled operation to his sons. Still, when viewed against the backdrop of Dilmah's homeland, such tests are nothing special.